Next: All of our products work with Windows 10! We’ve been hearing a lot about licensing companies shutting down lately. The most recent one to leave the scene is Sharify. 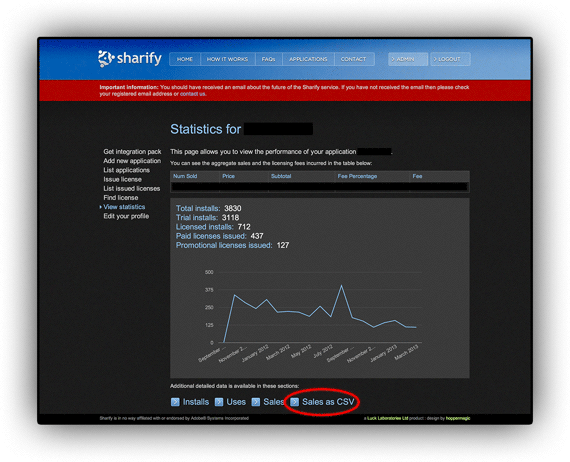 Apparently Sharify is shutting down at the end of March 2013. We’re providing a discount for all customers that switch to LimeLM. We’ve made importing your old data very easy. For customers that switch over to LimeLM anytime between now until the end of July 2013 you’ll get the Basic plan for the Solo plan price ($11/month). This special price lasts for as long as you stay on the Basic plan. We hope your business grows so you can outgrow the Basic plan and move up — mutual self-interest :). The shoot us an email (or give us a call) with something that we can use to verify you were a user of one of our competitors (any competitor — still standing, soon to shut-down, or long defunct). After you take those 2 steps, we’ll manually apply the discount to your account. The quick sales pitch: why LimeLM? LimeLM and TurboActivate (the part you include with your app) work on Windows, Mac OS X, and Linux. Solaris and Android support will be added soon as per customer demand. 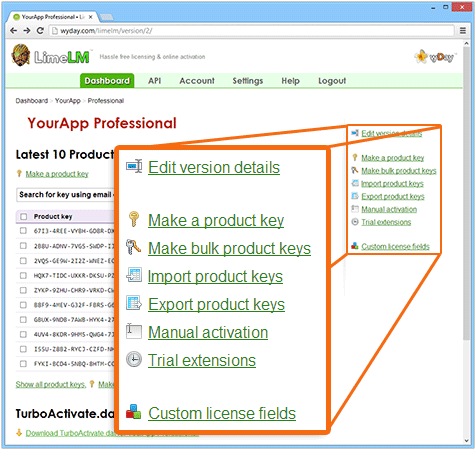 You can integrate TurboActivate into your app no matter what programming language you use. Right now we have example integrations for all major programming languages (C, C++, C#, VB.NET, VBA, Adobe AIR, Java, Delphi, etc., etc., etc.). We add more example integrations based on customer demand. We make things dead simple for you to create and manage your licenses. We’ve made things even easier when your customers activate your app. You can even use our pre-built TurboActivate wizard to make online activation (or even offline activation) absolutely painless. You can automate absolutely everything so you never have to log into LimeLM if you don’t want to. We have an extensive web API so you can integrate into your existing back-office processes. We have customers ranging in size from small one-man companies to Fortune 500 companies. In other words, large and small companies alike put their trust in us. We’ve been profitable since our first year in business and we’ve been growing steadily. This means we’re not going anywhere. On top of all that, if you’re still not sure whether you want to use LimeLM then you still have a couple of options. We have a free plan that you can play around with. Or you can contact us and we’ll walk through any questions or concerns you have. Switching to LimeLM is fairly easy, and you can make it seamless for your customers. Read the “How to switch your licensing to LimeLM and TurboActivate” article for the best practices. If you have questions or need help you can contact us by email, forum, or phone. We’ll be glad to help. Sign up for LimeLM right now. You’ll be glad you did. I love your posts. It’s too shameless to ask more but I would like to hear you everyday. Have you a twitter? None that we keep up to date. I just read your June 2014 post on “Joel On Software”. As a customer of Armadillo/Software Passport since April 2003 (v3.x, now at v9.64) I was not aware that they had called it quits until I saw these posts. I just got the upgrade for v9.64 in Nov/Dec 2013. I would hope that you would once again consider giving some of us new “refugees” a similar opportunity as you have in the past. I am a wyBuild customer as well. I am a new startup (a recently retired law enforcement officer) and am glad I will not be releasing my new software with Armadillo/Software Passport. Considering LimeLM for sure. The discount was just a limited-time experiment, unfortunately. If you have any questions using LimeLM (or wyBuild) we’ll be glad to help you. I understand. Thanks anyway. At least I won’t waste any time with Armadillo/Software Passport before my software goes out.